This page shows more detailed basement remodel photos. Our basement remodel was extensive. It involved the entire space. The Photo above shows our "Think Tank" chairs used during the laundry room remodel. I mentioned the use of making the space you are remodeling a "Think Tank" on the family room remodel page. I highly suggest spending time in the area you are remodeling deciding what you are going to do together. This gets the details straight. As you can see, We were right in the middle of the construction zone. 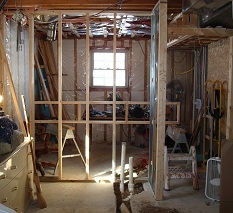 These basement remodel photos will show more of the construction side of the basement projects. The basement was usable originally then got water damage from a flood. That flood damage caused the floor covering to have to be removed. So until the remodeling started the basement became a storage area. We decided to change everything in the basement after evaluating our needs. This was done after spending alot of time in the area and using it as a "Think Tank". While it was being used as storage. 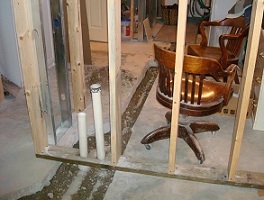 The photo below shows the family room area during the basement remodel. Notice the brick wall in the background, and the 2 odd chairs used as our "Think Tank" We started in the family room then proceeded to remodel the laundry room then finally created a home office next to the family room. We still have one more project to start- a full handicap accessible bathroom. We will love having a bathroom so close to the home office. 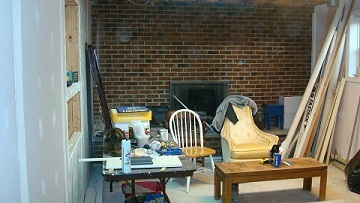 In the family room- There had to be walls removed, ceiling torn out and a brick fireplace was redesigned. New flooring was installed, built ins were made around the newly redesigned fireplace. An antique mantle was installed, after it was restored. The family room was the biggest part of the basement remodel project. The new family room is located in the original space but aside from the window remaining in the same location everything else has changed. The fireplace is in its original location but looks totally different. 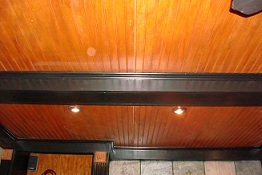 We installed a custom made ceiling with bead board and hand made beams. It is stunning. A very dramatic combination of colors and materials. 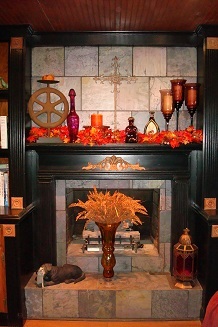 The photos below show the new ceiling in the family room and the way the fireplace looks now, decorated for fall. Sign up to get our FREE Improve your home and Garden Newsletter below. Periodically, I will send you valuable information to help you with your home and garden projects. 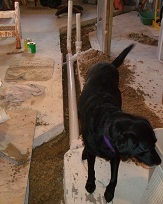 The photo above shows CJ our lab, inspecting the progress on the work in the laundry room area. 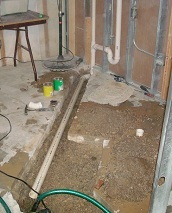 Look at the floor, that is where the concrete was saw cut to enable the new plumbing to go. 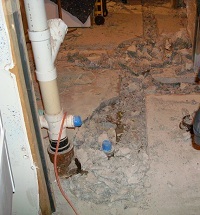 The photo below shows the floor before the loose concrete was hauled out of the area to install the new plumbing. 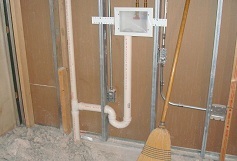 The photo below shows the new plumbing installed for the washing machine. The room is coming together with the new pipe going back into the floor as shown in the picture below. The laundry room wall goes up. That photo on the right shows the wall between the office and the laundry room, the cabinets, and sink will be located there.